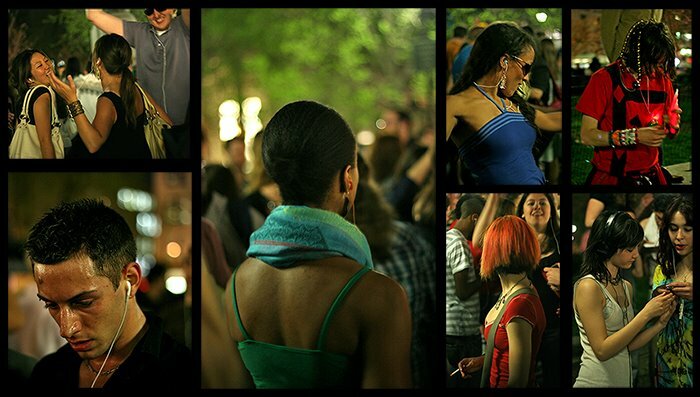 At dinner on Friday night, two friends informed me that there was to be a silent rave in Union Square Park. So, with camera in tow, we walked to Union Square, where activities were already in progress. Hundreds of people were gyrating, each to their music provided by their own portable music players, primarily iPods. Some were sharing sounds. I was immediately recruited by someone who introduced himself as Fong and said they were in desparate need of a photographer to cover the event for something he was putting together - what exactly, I don't know. Conversation was harried, facts were murky, - I never really got the specifics. But we followed each other around, targeting good photo ops - Fong getting dancers to sign waivers while I shot undulating bodies in very low light, the ultimate photographic challenge, at least in the city. Fun was had by all - Fong and I appeared to be the only ones stressed - trying to capture the photos and names of moving targets. Note: For gallery of photos on the Silent Rave - go here to my Flickr site.